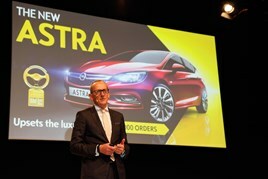 A 24-strong delegation of Vauxhall retailers were selected to join 100 of the most successful dealers across Opel Europe at a congress held at the brand’s headquarters in Rüsselsheim, Germany. The UK delegates attended the congress, which was held under the motto “Results count: Creating a successful future together”, at which Opel Group CEO Dr Karl-Thomas Neumann, Vice President sales and aftersales Peter Küspert, CMO Tina Müller and vice president Design Europe Mark Adams gave a detailed insight into the company’s corporate strategy. Küspert said: “Together with our top partners, we can achieve all of our goals. This congress was like a training camp with talented players preparing for the upcoming season. Team spirit and assertiveness were also the topics during the joint dinner in the simulation hall of the Lufthansa training centre at Frankfurt Airport. At the following get-together, extreme athlete, musician and manager Joey Kelly took to the stage and talked about the topic “No limits – how I can achieve my goal”. After the presentation, which took place last week, the dealers tested their own limits in an Airbus A380 flight simulator. The retailers represented Vauxhall at the congress were: Arnold Clark; Baylis; Beadles; Brandish; Bristol Street; Cawdor; Cresser Cars; Drive; Dudley Motor; FRFGummer; Go; Greenhous; Hutchings; JCT600; NOW; Pendragon; Perrys; Peter Vardy; Picador; Sherwood; Thurlow Nunn; Tustain; Vision; and Wilson and CO.